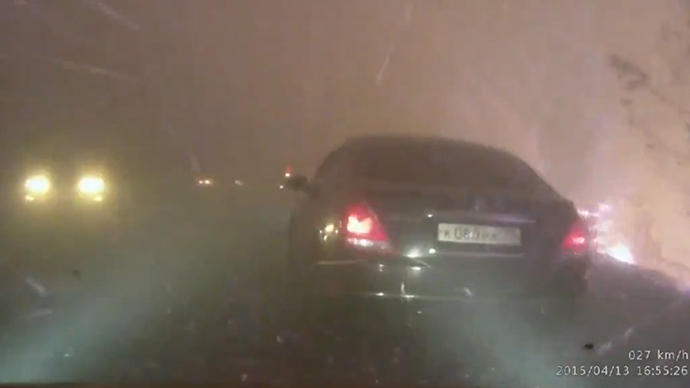 A scary video emerged online of the wildfire in eastern Siberia now trapping residents, as they try to flee in their cars. The blaze surrounds the vehicles and what looks like volcanic ash rains down on them. The grassland fire in Zabaykalskiy region, Russia, bordering Mongolia, has been raging since March 19, displacing people from over 1,200 dwellings in 20 separate towns and villages. Over the course of the Wednesday night and into early Thursday, the number of dead has doubled from 15 to 30, with nearly 500 people injured. There are a furthre two people missing, according to officials. The latest reports from the national forestry service indicate that over the space of one night the fire advanced to engulf over 1,500 square kilometers (930 miles), with 140 separate forest fires in progress. By contrast, the figure was half that on Wednesday. A total of 22 districts in the Zabaykalskiy region have been affected, with some 93 fires there alone affecting natural reserves, according to local authorities. All emergency situation procedures are still in place.